Remember that interesting teaser Mercedes-Benz released recently on its Facebook page? The one that purportedly shows a convertible G-Wagen? Well, here it is before you’re supposed to see it, and it will reportedly be called the Mercedes-Maybach G 650 Landaulet. The off-roader was meant to make its debut at the Geneva Motor Show but has since been leaked by AutoMailRU and fly-wheel, where a video and photos of the “luxurious off-road limo” were posted online. The Landaulet moniker, which is reserved for luxury vehicles that feature a soft top over the rear passengers’ heads, makes a return on the G 650. If you can recall, the last time Maybach made a Landaulet was the 62S-based version in 2007, which also starred in 2011’s Transformers: Dark of the Moon. Under the hood of the G 650 is a 6.0-litre biturbo V12 engine that is said to produce 630 hp and 1,000 Nm of torque, channelled to both axles via a four-wheel drive system. 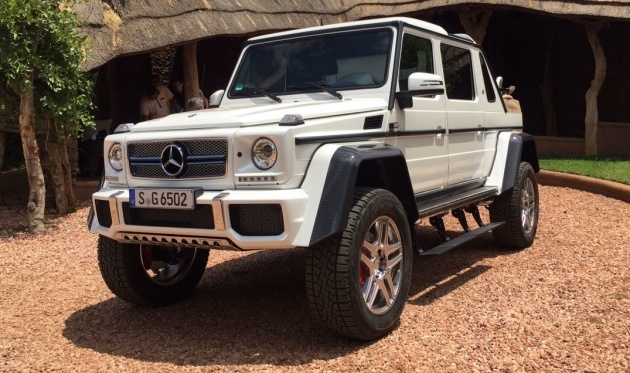 Like the regular G-Wagen models, the G 650 Landaulet also comes with locking differentials as well. Although it is built on the lifted chassis of the G 500 4×4², the vehicle’s wheelbase has been stretched from 2,850 mm to 3,428 mm, allowing for a lot more space in the second row (as much as 600 mm more). As you can see, all attention is focused on the rear passengers, where a foldable top allows them to let some sunshine in should they desire. Inside, there’s plenty of luxury touches such as powered seats, air-conditioning, an entertainment system with dual displays, plush upholstery and dashes of carbon-fibre. Only 99 examples of the G 650 Landaulet will reportedly be produced, making it even more exclusive than last year’s S 650 Cabriolet. Full details of the off-roader will be released once it makes its official debut, where we’ll find out the actual cost for all this opulence. going off road in style….